Today was an exciting day. I’ve been following the development of grabcad.com over the past year or two and they keep impressing me. I’ve always been excited by companies that diversify in unpredictable, but sensible directions. GrabCAD is one of these. Starting out as an online CAD file sharing platform, they broke the mold in the way they delivered their product, not only by using community sourced content, but also by creating a fun user experience with innovative features like point ranking systems for popular files and users. As their geometry-viewing technology improved, the site morphed into more of a web app with a lot more useful functionality and social media integration. The real diversification started however, when they decided to become more than a content sharing tool, and add content creation/editing tools. In a somewhat timely fashion, Autodesk’s new 360 products, namely AutoCAD 360 and Fusion 360 arrived on the scene, and a partnership was set up which meant that GrabCAD users could now create and edit 2D and 3D geometry inside the GrabCAD environment. It should also be noted that Luxion added a GrabCAD integration for their very popular Keyshot, to allow rendered images to be sent directly from their application to GrabCAD. A GrabCAD app for mobile devices rounded out the sharing/viewing workflows to make an all-round pretty useful toolset. Collaboration quite often means multiple users actively working on the same dataset, and when this happens, version control obviously becomes hugely important. So coming back to why today was exciting. There was an announcement that GrabCAD had added a desktop sync client (think Dropbox for engineers), version control, and partner workspaces. I’ll go through these in a bit more detail below. 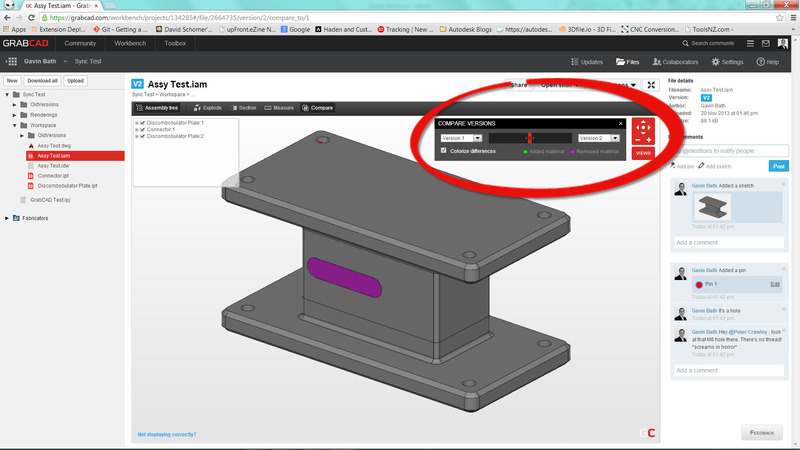 The desktop client is the link between your GrabCAD workbench (in the cloud) and your computer (in your office). 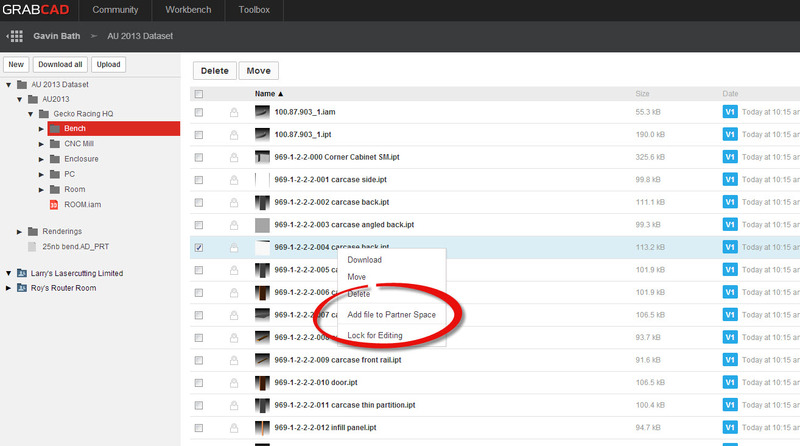 To set it up, you just download and install it, and then map a Workbench project to a local folder on your hard drive. It monitors differences between the local copy of the file and the cloud copy using Git (Wiki reference) technology which was developed for Software version control. This technology looks at file at a bit level and creates snapshots of the data which can be compared to see where differences have occurred. What this means, is that if someone that you are collaborating with, edits your files, the GrabCAD desktop client will detect that your local copy is no longer the latest, and it will give you the option of keeping your version, or getting the latest one from Workbench. The conflict resolution dialog is slick and the feedback is clear and concise. The application also provides quick links to your local folder. The version control extends through to the Workbench cloud app, where a version history is kept, and features exist that allow you to compare differences between versions. Of particular note, is the cool little version compare slider, which lets you visualise the changes using a clever colorization key based on whether material has been added or removed. This is probably the feature I’m most excited about. A very common hassle for designers/engineers is getting their manufacturing data ready to be sent off, and then the actual process of sending it off, to the suppliers. While many tools exist for rapid creation of data such as profile cutting data, there aren’t many tight workflows for actually delivering this data. Most companies I have seen resort to sending it via email. Everybody knows the frustrations of following conversations by email. Let’s face it, it’s an old technology, and while it has its place, I think the delivery of manufacturing data can be done much better. Partner spaces can be created and assigned to external teams / contractors / suppliers. Any files that you send to Partner Spaces will be accessible to the collaborators that you nominate for each one. The file doesn’t get moved from your original location, but what ends up in the Partner Space is effectively a link. This means that you can easily control who gets access to which data. The nice thing about this, is that your partners can review / comment on data in the workbench environment, and also visualise version changes and updates. Sure beats a long email trail. 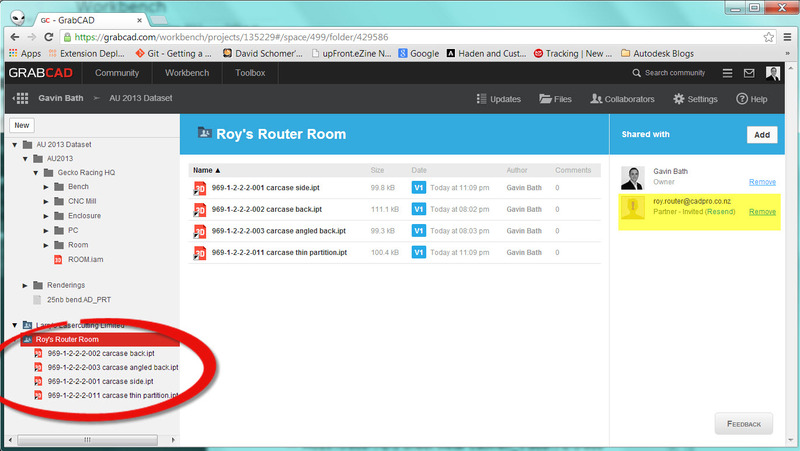 Here you can see files that have been assigned to Roy’s Router Room Partner Space. A short list of the files can be expanded in the browser, or full details viewed in the main window. On the right you can see the access control list. What I’d really like to see GrabCAD do now, is to make available some more property information, as well as filters, so that model files in the main Workbench project folder can be sorted and grouped by material, thickness. When this is possible, categorising your files to send to partner spaces will be a very very nice way to work. 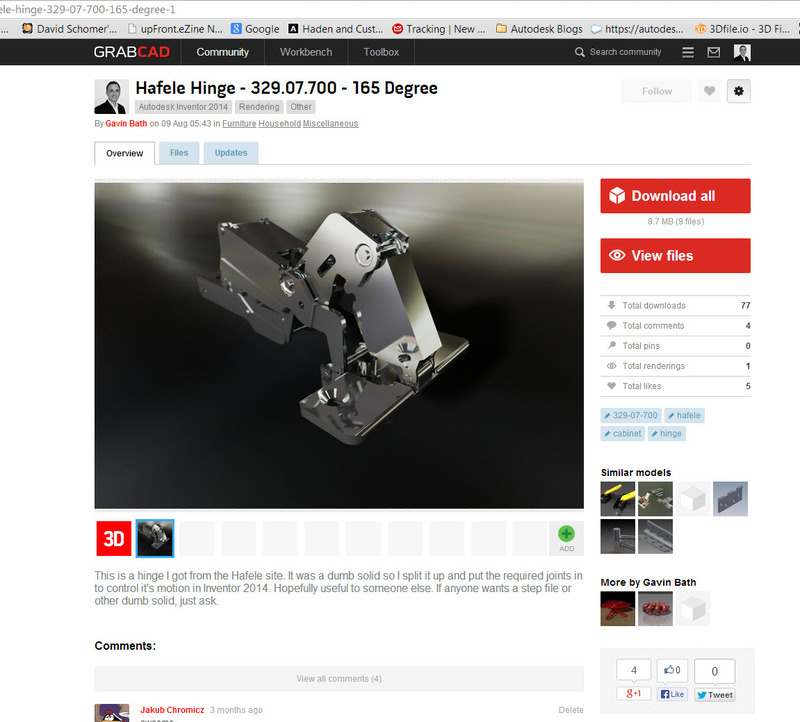 Well done GrabCAD, keep up the good work and I look forward to hearing more exciting developments.